Book as low as P399 Cebu Pacific base fare promos for trips to local destinations. 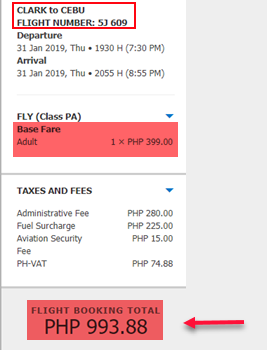 Check the new Cebu Pacific promos which you can use for trips on the first months of incoming year 2019 for domestic travel and from December 2018 to April 2019 for international flights. Featured on this sale are local trips from/ to Clark as low as P399 base fare. Cebu Pacific international seat sale starts at P894 base fare promo for journeys Manila to Kota Kinabalu. Booking for the Cebu Pacific sale tickets is ongoing and will end on November 18, 2018. Limited promo tickets on sale! Book or buy the low fares fast! 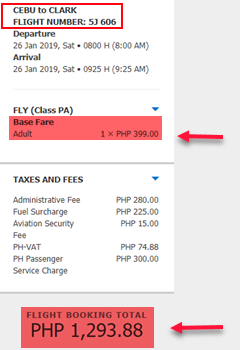 The promo tickets of Cebu Pacific are base fare promos, that is why do not be surprised if the total fare will be more than the quoted ticket prices. Covered by the base fare promos are the fare and 7 kilos hand carry baggage; Web Admin Fee, Fuel Surcharge, VAT and terminal fees are excluded. One way of availing the promo is thru online booking at Cebu Pacific website: www.cebupacificair.com. Promo Code not needed when booking these affordable fares. Purchase the low fares at Cebu Pacific Sales and Ticket offices in Manila, Luzon, Visayas or Mindanao. Reserve tickets by calling the Cebu Pacific Reservation Hotline Numbers in the Philippines and other countries. Buy the affordable fares via the accredited travel agencies and ticket booking offices. Book via Cebu Pacific Mobile App. As in all sale, Cebu Pacific promo fares are on limited availability; promo deals last while seas on sale are still available. Book or buy the Cebu Pacific low fares and enjoy your vacation to your chosen destinations! 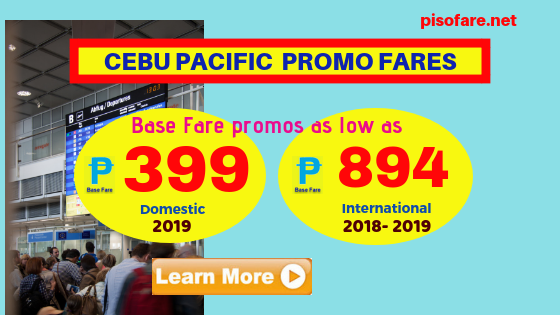 Follow our Facebook: PISO FARE TICKET for more Cebu Pacific seat sale and piso fare 2019, Air Asia Red Hot Sale, Philippine Airlines promos and more!